Some cities in the world struggle to keep their streets active after the work day ends. The major cities in Vietnam, however, sometimes struggle with the opposite problem: too much activity on their streets. Despite motorbikes being the predominant form of transportation—and not transit or two feet—Vietnam’s major metropolises are teeming with bustling, dynamic streets that remain populated through all hours of the day. People eat, sleep, sit, chat, drink, shop, work, and most undeniably, linger on the streets of Ho Chi Minh City. They people-watch, dance, peddle trinkets, and fix motorbikes on the streets of Hanoi. In Da Lat, people sell local flowers, munch on spicy strawberries, and meander through the weekend walking streets. What is it about the streets in these cities that invite people to stay? Streets—and not massive roads, highways, or other intimidating thoroughfares—make up much of Vietnamese’s cities core transportation network. Streets are places that build wealth by prioritizing businesses, residences, and places for people. Roads, on the other hand, are transportation thoroughfares meant to efficiently get people from one productive place to another. With high speeds and a lack of destinations, roads make for an unpleasant pedestrian experience. Much of suburban America features a blend of the two, or “stroads” as Strong Towns calls them. place that builds wealth by prioritizing businesses, residences, and places for people. transportation thoroughfare meant to efficiently get people from one productive place to another; unpleasant pedestrian experience due to high speeds and a lack of destinations or interest. blend of road and street featuring ample commercial destinations—but of a primarily auto-oriented design. Pedestrian infrastructure is limited or absent. Stroads might be sprinkled with various big box stores, fast food restaurants, and occasional strip malls, but they are dominated by huge swaths of car parking. Being a pedestrian on a stroad can feel more alienating than being a pedestrian on a road, simply because the infrastructure indicates cars get the final say. Fortunately, Vietnam’s urban environments have a plethora of human-scale streets, delineated by two and three-story buildings that abut the sidewalk. Rarely more than four lanes wide, the streets are manageable corridors that offer plenty to observe and explore all at eye-level. The presence of streets as opposed to roads or stroads doesn’t guarantee an active city. Streets thrive not only when the built environment prioritizes people, but also when there are things for people to do on the streets. Walk down a street in Ho Chi Minh City and find coffee shops, food stalls, clothing shops, convenience stores, ATMs, market stands, a school, residences, and of course, seating. Little plastic stools dominate the outdoor chair market in Vietnam, and make for a highly mobile, incredibly affordable aspect of why people linger on the streets of Hanoi. The chairs may help people to stay, but the delicious and affordable street food gets people to the streets in the first place. 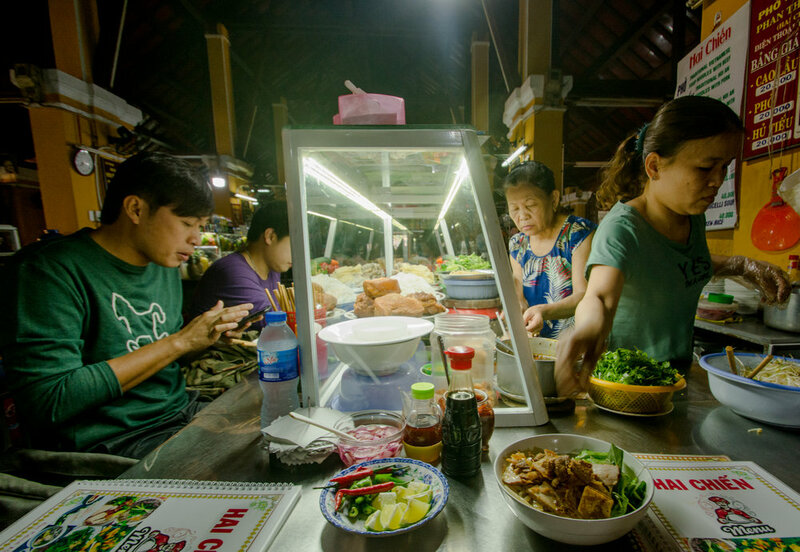 While street food stalls may not adhere to American health code standards, their prevalence is a fundamental piece in the popularity of Vietnamese streets. Food stalls provide a low-overhead opportunity for emerging entrepreneurs, a quick and cheap meal that isn’t industrialized “fast food,” and informal street activity that takes concerted efforts to match in American cities. The seamless blend of residential and commercial activity permeates much of Vietnamese cities, particularly older neighborhoods dominated by tube houses, and is not restricted to specific mixed-use zones or business districts. Even alleyways off of “main streets” maintain a commercial pulse, evident through the noodle shops, coffee stands, food carts, water stalls, tutoring centers, and other random businesses that dot the secondary and tertiary streets of the more “residential” districts of Saigon. The closest cities come to residential pockets are the houses buried in the deepest maze of alleyways. Still less than a stone’s through from stores and food, the smaller alleyways help insulate houses from the busier streets and provide a sense of peace in the otherwise bustling city—but are almost never strictly residential. New developments on the outskirts of Ho Chi Minh City and Hanoi depart from the approach traditionally taken in Vietnamese cities. With guarded entrances, copy-and-pasted rows of houses of the same design, and strict residential-only uses, developments such as Riviera Cove, Park Riverside, and Nine South, mimic the car-oriented, privatized, and finished-state building ethos of suburban America. They are designed on the principals of privacy and keeping people out, whereas existing regions of these cities depend on a communal and public exchange. Particularly apparent in tube house neighborhoods is the notion that the street is the extension of the private realm, an asset that citizens are entitled to for relaxation, commerce, parking, and sleeping. The street in front of a family’s house becomes the seating area for their noodle shop in the morning; in the afternoon, it’s their refuge from the heat of their minimally-air conditioned house and the place to mingle with neighbors. Just like parks, streets are viewed as a supplement to tight living quarters—even without the special designation of a “walking street” or other public space—all while providing mobility to motorbikes, cyclists, pedestrians, and the occasional car. Visit a street throughout the day and witness a constant metamorphosis of uses and inhabitants. Vietnam’s tendency towards motorbikes, encouraged partly by high taxes on cars, influences and enables active streets. In cities where cars dominate transportation, such as Bangkok and Orlando, Florida, streets are necessarily larger, and are often true roads instead of streets. A sea of car traffic is much more impenetrable than that of motorbikes, and people—hidden behind metal frames of Hyundais and Toyotas, are invisible. Motorbikes, on the other hand, allow for smaller streets and roads, and even during a traffic jam, help to keep people visible. Highly compact and functional, motorbikes accomplish impressive feats of transportation without requiring large amounts of land for storage or movement. Much of new Bangkok features "roads" that primarily serve to transport automobile traffic between districts and commercial areas of the city. 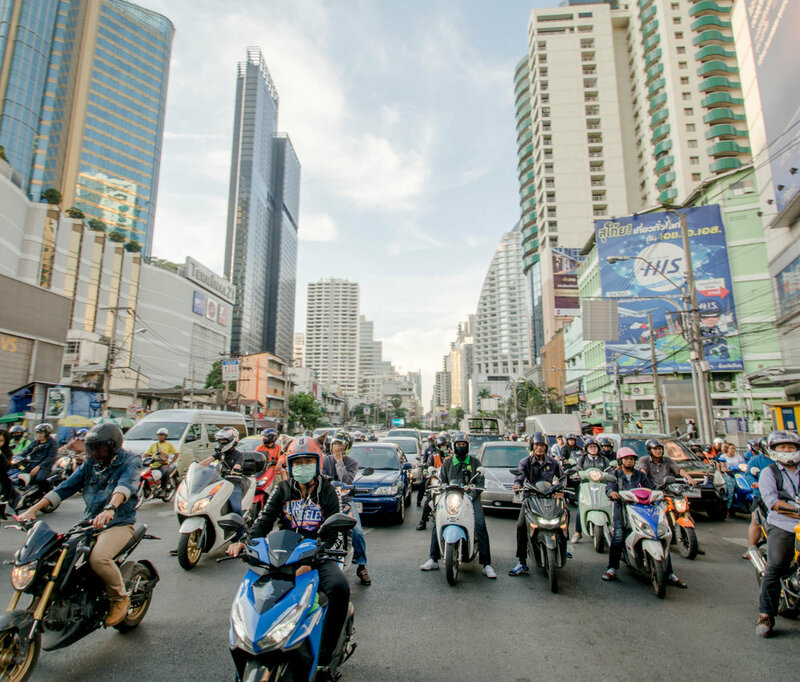 Motorbikes are still commonly used and their space efficiency proves effective in moving drivers past lanes of car gridlock—but they remain greatly outnumbered by private automobiles and taxis in Thailand's capital. Rain deters street activity to an extent, but the Vietnamese, accustomed to spending half of the year in a wet season, persist through the precipitation. Much of their street life easily adapts to water: vendors don matching rain pants and rain jackets; food stall owners hang tarps to protect their wares; and motorbike drivers tear through the rain in ponchos specially designed to cover them and their bikes. The Vietnamese persist through the rain not because they enjoy it, but because they must. By and large, people navigate Vietnam by motorbike and don’t have the luxury of a sealed-in, waterproof car to get around. Vendors rely on the informal space of streets to achieve economic success for the day. They must plan for and cope with the inevitable setbacks the rainy season, or an occasionally rainy day, brings. Much more dangerous to street life are policies banning hawkers and other street activity. In 2008, Hanoi restricted vendors to certain streets in an effort to ease traffic problems and impose a more civilized street culture. Ten years later, Hanoi’s street life still seems strong, but this policy and other efforts by the government are worrisome. Where will the vendors turn if streets can no longer serve as their livelihood, without training programs and other social services to help? Cities, particularly those in the U.S.A. fighting against suburbanization, hire consultants, approve plans, and invest money with the hope of making their urban cores more “active.” Because active streets, by and large, are the sign of a thriving city. Active streets mean more investment in local, brick-and-mortar enterprises and a stronger economy. They mean higher chances of people bumping into friends, befriending strangers, and becoming attached to their community. They mean lower rates of crime and higher rates of safety, because the mere presence of others helps deter unwanted behaviors. On the other hand, active streets aren’t always pleasant. They can appear cluttered and chaotic. They can make for difficult—and even dangerous—walking conditions. They can seem dirty, smelly, and crowded. Living next to non-residences can bring unwanted sounds, like the school bell at 7:30 in the morning, or the buzz of a motorbike repair shop. But unwanted noises and neighbors occur even in less densely-packed cities, such as Orlando, Florida, where neighborhood schools intermix with houses and residences surround an international airport. Unwanted noises and unusual neighbors are, in a way, part of city life. We need proper cities—places that get a lot more done in less space—so that there are remote places to escape to when people wish. We also need streets that are clean, safe, popular, and loved. Vietnamese wisdom would suggest cities striving to stimulate their streets relax regulations, demand mixed-use developments, allow sidewalk eating, and most of all, embrace the seating, impromptu performances, and loitering of a proper, bustling street.